A suncatcher is like the optical equivalent of a wind chime. The pendant has 120 facets cutted and polished by digital machine. Every facet is the same and diagonal line is accurate. Above the pendant there are 9 rondelle beads of 9 colors representing the colors of sunshine, like a rainbow. This crystal ball prism is hand-crafted of K9 crystals cutted into raindrop shape. The decorative design is suitable for preschoolers to learn photology. Hang the chakra item as feng shui decor and create a harmonius surroundings for kids. It is believed that suncatchers were first made by the Southwestern Native-Americans. 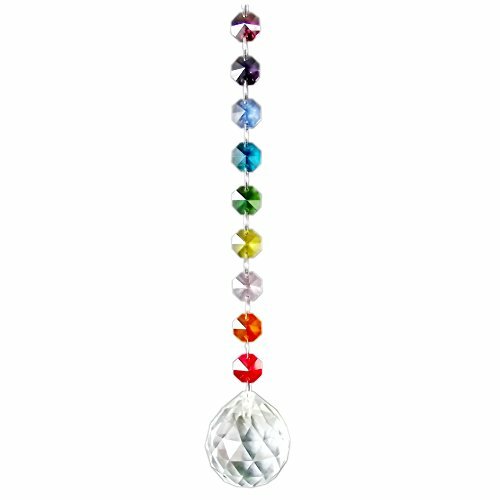 A crystal suncatcher is hung indoors at windows to reflect light into assorted colors. Red, orange, yellow, green, blue, indigo, violet; All 9 Colors of the Rainbow. Length: 10.2 Inch. Pendant Size: 40mm. Material: K9 Crystal. Stained Glass. Steel Wire. Ideal decoration for chandeliers, lamp, christmas tree, windows and nearby light source. Can be easily hung for the crook connected with the crytal chain. If you have any questions about this product by AirSun, contact us by completing and submitting the form below. If you are looking for a specif part number, please include it with your message.